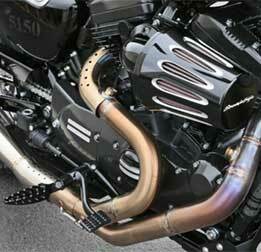 « Harley Touring Performance Upgrade. The Kraus ST Inverted Front End. Published by Cyril Huze April 14th, 2016	in Builders and Customs. 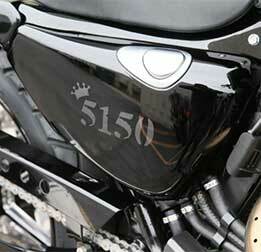 It features a dual headlight to provide protection in a rugged environment, a 1200cc engine conversion with tuned exhaust to optimize performance, a fabricated tank with padded inserts that allows the rider to connect with the road, a chain conversion, a custom mini fairing, taller wheels and many genuine black H-D aftermarket parts. Good, but I saw better from some of the competitors. Like it too. Will attract youngsters? I like it. 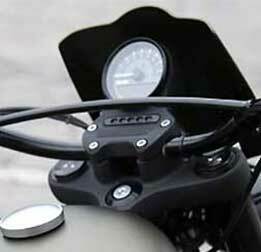 Make the front fender a hair bigger to match the tire size, though, and balance the rear one. Pleased to see Euro style in USA. 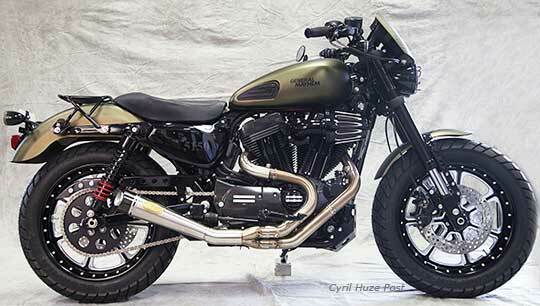 Never understood why Harley can’t build a Sporster with inverted fork, 17″ Alu Wheels, strong dual disk brake and engaged riding position. 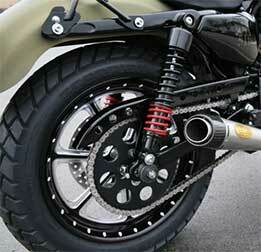 I like this bike also, except the chain, belt is so much better, I don’t understand this conversion. I dig it. I would ride it. Congrats to my friends Kirk, Bud and the whole gang at Hal’s! It is great to see such work still coming out of the dealership I once called home.